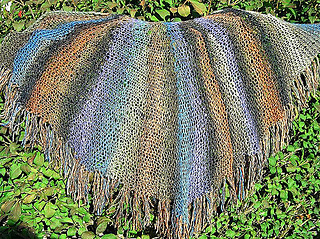 A perfect shawl for the cooler days and nights of fall. Light and airy, just enough to take the chill off when needed, or to add a splash of color without being too hot or heavy. I chose Noro Blossom for this shawl because it really shows off the short-row shaping with its self-striping qualities. The wedges are defined by color changes. If you don’t want the color-block look, use a different yarn such as Trendsetter Dune, or anything that gives the same gauge. Designer Note: Noro Blossom is now discontinued. 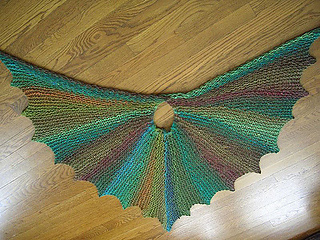 It is still available from a few rare places online, and continues to be my favorite choice of yarn for this shawl. However, there are many other yarns that will be just as lovely. 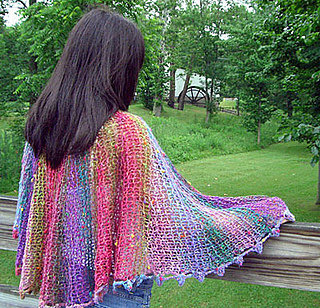 My second favorite version is Noro Silk Garden held with coordinating lace-weight mohair. Yum! Designer note regarding needle size: There seems to be some confusion over needing the size 35 needles for this pattern. When the pattern was first submitted to Knitty.com, they changed the needle size for the bind off to size 17. It is very hard to get a loose enough bind off with a size 17 needle. Even with a size 35 I will sometimes have to redo the bind off more loosely. 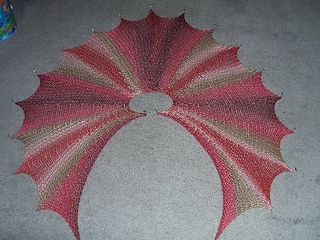 This shawl is blocked very agressively, and the bind off edge needs to be able to stretch as far as the knit rows next to it, therefore the bind off needs to be EXTREMELY loose.